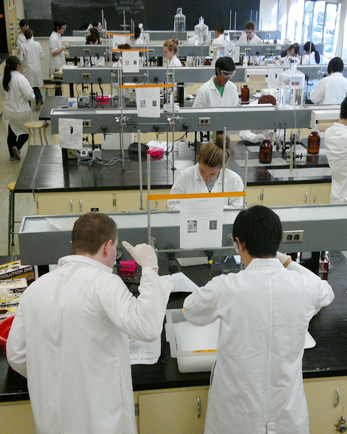 Students cannot enter directly into the Biochemistry Program at the first year level. Entry into the program occurs at the second year level. See UBC Admissions for information on applications for entry into the Faculty of Science. After the first year in the Faculty of Science, students complete an online specialization selection process. At minimum, BIOL 121, CHEM 121/123 and MATH 100/101 (or equivalent) must be completed to be eligible for entry into the Biochemistry program at this point. Entry into the program is competitive based on academic average in the first year winter session. In recent years, the academic average required for admission into the second year of the Biohemistry program has varied between 72-76%. For further information please see our advising pages. Dr. Warren Williams is the Advisor responsible for second year admissions. Admission requires, at minimum, the completion of BIOL 200, BIOC 203 (or BIOL 201 with min 76%), and CHEM 203, 213 and 245 (or equivalents). Entry into the program is competitive based on academic average in the second year winter session. In recent years, the academic average required for admission into the third year of the Biohemistry program has varied between 70-72%. Please note that second year biochemistry status DOES NOT guarantee advancement to the third year of the program; entry into the Bioc 301 lab course is required. For further information please see our advising pages. Dr. Jason Read is the Advisor responsible for third year admissions. Entry into the program at the fourth year level is handled on an individual basis. Dr. Covey is the Advisor responsible for fourth year admissions.